Most equestrians don’t need an excuse to go shopping for more horse gear. But here’s the best excuse of all – celebrate the official birthday of all horses in the southern hemisphere by buying a new safety helmet on discount on August 1. Equestrian retailers in eight countries have signed up to be part of this year’s annual International Helmet Awareness Day on August 1 – the official equine birthday for horses in the southern hemisphere. A nasty road riding injury was avoided, thanks to this helmet. The Riders4Helmets.com initiative is in its sixth year, and gives riders an opportunity to buy a safety helmet at a special one-time discount. But more importantly, it is an opportunity for equestrians to be educated. 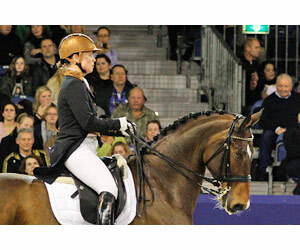 International Helmet Awareness Day was founded in 2010 as a result of a riding accident by US dressage Olympian Courtney King-Dye, with the aim of educating equestrians on the benefits of wearing a properly fitting, secured and certified helmet. “Whether you are a helmet manufacturer, retailer or equestrian, I hope that you will lend your full support to this important event in 2015,” King-Dye said. Many of the retailers are also offering educational events in their stores. On the day Riders4Helmets will be live streaming “Get Educated” webinars, in which equestrians will be able to ask a variety of experts real-time questions. The webinars will feature experts in fields such as: Traumatic Brain Injury and Concussion; Helmet Manufacturers and; Traumatic Brain Injury Survivors. The confirmed line-up of participants will be announced in coming days. Helmet brands that have committed involvement in International Helmet Awareness Day to date include: Antares-Sellier, Champion, Charles Owen, Devon Aire (Aegis), Gatehouse, GPA, International Riding Helmets (IRH), KEP Italia, LAS helmets (Leslie Sutcliffe), One K, Ovation, Samshield, Tipperary, Troxel and Uvex. Retailers who register via riders4helmets are eligible to receive discounts from the helmet manufacturers. Registration before July 24 is urged, in order to receive educational materials in time for the event. However, late registrations will still be accepted through July 31st. Visit www.riders4helmets.com/ihad/ on August 1 for the most up to date list of retailers, and to learn more about the awareness day. Follow the campaign at www.facebook.com/riders4helmets and http://twitter.com/riders4helmets.